Running Caltrain down the middle of the peninsula corridor, with HSR tracks flanking it on the outside, would maximize operating flexibility. For both HSR and Caltrain, the many pros and few cons of this "fast-slow-slow-fast" (FSSF) configuration were discussed before. In this configuration, each Caltrain station would have a single central island platform accessed via stairs, ramps and/or elevators from grade-separated streets or pedestrian tunnels running underneath and perpendicular to the tracks. The archetypal Caltrain station would consist of a 750-foot island platform (sufficient for 8-car trains), 30 feet across at its widest point. The tracks would slew apart and drape along either side of the platform along a gentle curve, with the platform tapering slightly at its ends. The technical term for such a track arrangement is a "wow" around the platform. Pedestrian access in the form of stairs and ramps could be built beyond the ends of the platform. Seen from above, the arrangement would look vaguely like an elongated football--hence the name, Football Island. On Football Island, the typical station amenities would be shared among both northbound and southbound directions. One set of ticket vending machines, passenger shelters, benches, lighting, visual information displays, etc. would suffice to serve both directions. The platform space itself would be about twice as wide as today's Caltrain platforms, providing a safe space for waiting passengers well away from any trains that might speed past the platform without stopping. Access to and egress from the platform would occur at both ends and near the middle (total 3 places) to provide a safe waiting space without confined dead-ends. More people would be present on a platform that serves both directions, so passengers would be less likely to feel isolated or unsafe. Underneath Football Island, cross streets (as typically found near Caltrain stations) would pass under the station, typically near the ends of the platform--although the design is flexibly adaptable to any local street configuration. Bus stops would be located right underneath the platform, allowing connecting passengers to switch between bus and train via a single flight of stairs (or a single ramp) without ever needing an umbrella during rainy season. The station would connect into the pedestrian fabric of each town with six different approaches (3 paths under the tracks, each accessible from east and west.) There would never be any confusion as to which platform to wait on, and clear signage on the platform and trains would indicate the correct service direction to new users and regular commuters alike. Football Island would be replicated at every Caltrain station for a consistent look and feel, with minor variations to accommodate the local street configuration. The Football Island concept does not fit the stereotype of what an American commuter rail station looks like. That's why the people in charge of designing new stations for the peninsula corridor might initially be suspicious of the idea. Here is a list of objections they might raise. Platforms must be tangent (straight) to meet ADA regulations. In today's regulatory environment, "curved platform" might seem like an oxymoron. Just like a turning semi-truck needs additional clearance on the inside of the turn, long train cars serving a curved platform need a wider gap to clear the edge of the platform. This eats into the maximum 3-inch gap permissible under ADA regulations. By how much? Football Island would be built on such a wide curve radius (10 km / 6 miles) that an 85-foot passenger car would have a maximum lateral displacement of 4.5 mm (3/16 inch), which amounts to just 1/16th of the permissible gap. For ADA level boarding purposes, Football Island is essentially a tangent platform. Unfortunately, the specifications for HSR (TM 2.2.4 section 6.1.3) limit platform curvature to a minimum of 20 km / 12 miles, and only under exceptional circumstances requiring special approval. HSR passengers would be uncomfortable with all the twisting and wowing around Caltrain stations. Straight tracks are necessary for a smoother ride. 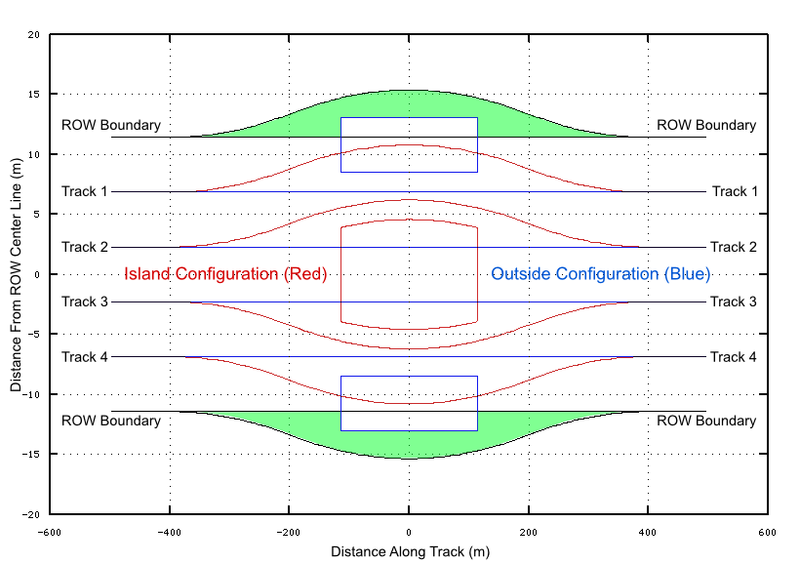 The 10 km curve radius (zero-degree, ten-minute curve in ancestral railroad units) is very gentle for the 200 km/h (125 mph) maximum speed envisioned on the peninsula. The curve could be fully compensated by less than 50 mm (2 inches) of superelevation on the outside pair of HSR tracks, something exceedingly unlikely to cause discomfort or motion sickness, let alone spill anyone's coffee. The inside tracks for Caltrain would not need any superelevation at all. Again, unfortunately, the specifications for HSR (TM 2.1.2) state right up front that "Over four changes in direction per mile shall constitute an Exceptional condition." That's all well and good at 220 mph, when a mile flashes by in 16 seconds, but this standard is overkill at a more sedate 125 mph. Curved track is more difficult and expensive to maintain than straight track. For card-carrying AREMA members accustomed to laying out freight tracks, this principle may hold true. Not so for high-speed passenger rail: the precise alignment and maintenance required to operate at 200 km/h (125 mph) is equally demanding on straight track and curved track. As to complexity of the alignment, we can safely say that ancestral 100-foot chains have been replaced by lasers, GPS and computer-driven tamping and lining machines that can dress track to millimeter accuracy, regardless of whether it is straight or ever so slightly curved as in the case of Football Island. The wheel-rail interface won't know the difference between tangent track and a 10 km (6 mi.) radius curve driven at just 200 km/h (125 mph); additional wear will be nil. Football Island would require much more land, to provide clearance for the tracks to wow around the platform. Compared to a traditional arrangement with 16-foot outside platforms (blue lines), Football Island (red lines) requires 2220 m2 (24,000 square feet or 0.5 acres) of additional space. 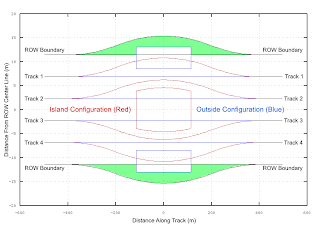 This extra space is shown by the area shaded green in the figure at right, assuming that the right-of-way boundary is 4.5 m (15 ft) from the nearest track center line. 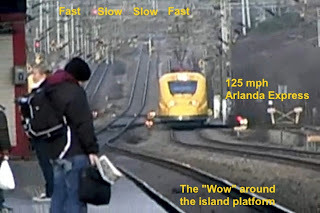 Compared to yet another candidate configuration, a one-sided wow with three straight tracks and one track wowing around an island platform with a radius tightened to 7.7 km (to account for slower commuter train speeds), Football Island uses about 0.2 acres less land. 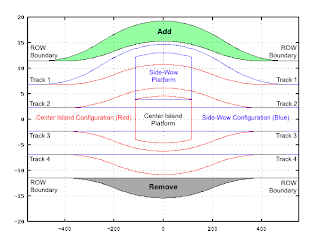 See figure at left; the blue side-wow configuration uses additional area shaded green, minus the portion shaded gray. The green area is larger than the gray area, showing why the side-wow configuration uses more land than the Football Island configuration. Placing an island platform between the tracks impedes passenger access. While an island platform indeed prevents direct access along its entire length from the local area around the station, consider that a typical Caltrain passenger will use the same station twice per trip: once on each leg of the journey, using the northbound and southbound platforms once each. Therefore, even with outside platforms, the passenger must use grade-separated undercrossings on at least one leg of the journey. If you tally the number of stairs and the distance walked through access facilities on a roundtrip journey--an objective measure of accessibility--Football Island is no worse than a grade-separated conventional outside platform, especially if the station is elevated. Nobody else does it that way. Anybody in Silicon Valley would tell you that's no reason to be afraid to innovate. Nevertheless, there is a precedent as shown in the opening photo: the FSSF configuration with island commuter platforms is used to great advantage in Stockholm, Sweden, where the 200 km/h (125 mph) non-stop Arlanda Express runs on the outside tracks, with local commuter service on the inside tracks with island platforms. The photo above was taken from about 1:40 in this video. Another video shows an amazing side-by-side race with an Arlanda Express, shot from the cab of a commuter train; note crossovers providing access between slow and fast tracks. The Football Island concept deserves serious scrutiny for the Analysis of Alternatives process currently underway for the peninsula rail corridor, and it should not be dismissed out of hand just because a couple of poorly conceived requirements stand in the way. Football island would enhance the peninsula commute while ensuring the smooth flow of local and express traffic, without requiring hulking flyover structures or stacked arrangements to provide flexible access between slow and fast tracks. Caltrain's petition for a waiver of compliance from certain FRA crash safety standards is on the federal docket as of Monday, January 25th. This marks the start of a 45-day comment period. All documents associated with the petition can be found under docket number FRA-2009-0124. Obtaining this waiver is key to the transition from Caltrain's existing equipment to the latest European-style electric trains (which meet different but equally effective crash safety standards), and also blazes an important regulatory trail for the peninsula HSR project. It will be interesting to watch what sorts of comments are received, e.g. from freight customers potentially dissatisfied by more restrictive operating hours (midnight to 5 AM) or from U.S.-based vehicle manufacturers who might fear the market being opened to European suppliers. Stay tuned. In San Carlos, plans are afoot to build a so-called "Transit Village" on a strip of vacant land adjacent to the train station. The land, owned by Caltrain and SamTrans, the county transit agency, was acquired for construction of the grade-separated berm (see Focus on San Carlos). The Draft EIR for the Transit Village project is currently open for public comment. How will the project affect the proposed high speed rail service? The project will not affect the proposed high speed rail service because the project site design already incorporates the necessary space for the future high speed rail service. A recent article in the San Mateo Daily Journal, highlighting concerns about the project, failed to mention the high-speed rail issue even once. Meanwhile, HNTB, the engineering firm in charge of the peninsula rail corridor, is actively considering several design alternatives that would widen the corridor to well over 100 feet at the San Carlos station. One of these alternatives is to run a pair of HSR tracks west of the existing station, right where the Transit Village buildings are planned. Perhaps this is a game of who gets there first, but no matter which way you slice it, four tracks plus platforms are going to exceed 100 feet in width. The project will very much be affected by HSR, quite possibly up to eminent domain and demolition. Anyone who says otherwise is trying to sell you a Transit Village. Who will pay for this egregious lack of foresight? Probably the suckers who buy the residential units, and the suckers who pay taxes to fund needlessly expensive right-of-way acquisition. Remember, this little soap opera will take place on land that is currently owned by Caltrain and SamTrans! Why pull another San Mateo? Have Caltrain and SamTrans learned nothing about sacrificing valuable railroad right-of-way on the altar of cities' pet projects? Is somebody in Sacramento going to wake up and knock some heads together? Or is it on us to foot the bill after the mess is made? Back in July, the CHSRA issued its annual Program Summary Report summarizing progress to date and laying out the upcoming project tasks. This document contained a comprehensive list of deliverables from the program management team, including a number of engineering technical memoranda and drawings listed on pp. 53-61. These memoranda and drawings have direct bearing on the peninsula rail corridor in that they form the prescriptive framework for all the engineering design. The Palo Alto grassroots organization Citizens Advocating Responsible Railroad Design (CARRD) requested that these documents be shared with the public. The CHSRA may not have been especially keen to release them, but CARRD's push was persistent and successful. The documents cover the entire state, which consists primarily of 220-mph very high speed, dedicated tracks. The peninsula is a different animal, with 125-mph top speeds in a shared corridor with Caltrain and freight trains, so use proper care when applying to or inferring conclusions about specific peninsula situations. The peninsula-specific memo (TM 1.1.7) is due for initial release in June 2010. The documents are a snapshot in time, as of January 2010. Amid all the hoopla about high-speed rail and quadruple tracking on the peninsula corridor, it's easy to miss the original point: to convey people from point A to point B as quickly and conveniently as possible. The peninsula rail improvements aren't just about pouring concrete and running zoomy trains; they ought to be about providing a service, especially to the dominant users of the corridor, namely local commuters and travelers, people who live and work right here on the peninsula. This important constituency is too often eclipsed by the bright spotlight shining on statewide high-speed rail. Service is where it all begins, as demonstrated when Caltrain's Baby Bullet started operating in 2004. Because the Bullet increased speed and convenience, ridership soon grew by a third, and Caltrain was featured on the cover of industry journals. But the Baby Bullet was just a baby step compared to what might soon be possible, and Caltrain can't afford to rest on its laurels. The only three things that will really matter for the future of Caltrain are service, service and service. Timetables are admittedly boring, but they are a compact and efficient way to describe a transit service. Improvements to the service are best understood through their effect on the timetable. Caltrain passengers stand to benefit from several future service improvements that can be sorted into two categories: (a) service improvements that come "for free" as a result of electrification and swift new EMU trains, and perhaps more importantly (b) service improvements that require a little bit of planning, creativity, intelligence, and effort to pull off. Caltrain is relentlessly focused on (a) and appears distressingly oblivious to (b). Quicker start-to-stop times, since EMUs are more powerful and lighter than today's anemic and heavy diesel trains. The time savings from faster acceleration and braking really accrue when a train makes many stops. Shorter station dwell times, since EMUs will have more doors and level-boarding for rapid passenger loading and unloading. Faster top speeds, since the peninsula corridor will be grade-separated and use a modern signalling system shared with HSR. While acceleration is far more important than top speed, improving from today's 79 mph speed limit to about 100 mph does yield marginal benefits. 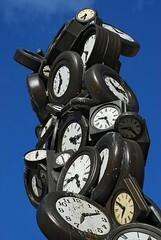 Clockface scheduling, known in german-speaking countries as Taktverkehr (literally, "traffic to a beat"). In a clockface schedule, every train runs on a periodic timetable with a regular stopping pattern that repeats at some fraction or multiple of an hour (e.g. every 15, 30 or 60 minutes). In Switzerland, the entire country runs on a regular beat. Clockface scheduling eliminates annoying Caltrain questions such as "When is the next train coming?" or "Does it stop where I'm going?" A clockface schedule takes all the guesswork out of taking the train by allowing simple memorization of the timetable (e.g. :07 past the hour, every 15 minutes) Clockface scheduling is also a key enabler of intermodal connections. Connecting feeder services, whether bus, employee shuttle, light rail, HSR, etc. can be synchronized to the "beat" for quick, hassle-free transfers. Zero-wait transfers between local and express trains, so customers at smaller station stops can benefit from fast express service to the destination of their choice. Zero-wait transfers extend the benefit of express service to a much wider selection of origin and destination pairs. A zero-wait transfer means that an express train overtakes a local at zero speed, on the opposite side of the same platform. Passengers simply walk across the platform to switch to a faster or slower train, as suits their destination. Overtaking at zero-speed enables such transfers in the first place; if one were to wait for the express, the time savings from the express would evaporate before they could provide any benefit. Two, or maximum three, station stopping patterns, for simplicity. Customers no longer fret whether any given train will stop at their destination; no more agonizing Caltrain questions like "Should I get on this train or the next?" or "Does this train serve the stop where I'm going?," no more squinting at the timetable. Caltrain conductors would no longer make long-winded and repetitive announcements about upcoming stops and which stations will or won't be skipped. To think about timetables without having to stare at big tables of numbers, it helps to use a graphical representation of rail traffic known as a string graph (also known as a stringline diagram). Traffic is displayed as a time-distance graph with time along one axis and stations (distance) along the other. The movement of each train is represented by a string that connects each station according to the time intervals required to move from one station to the next. In effect, a string graph is the visual equivalent of a timetable. 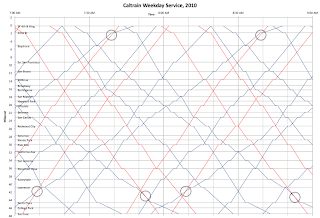 For example, the weekday morning Caltrain timetable is shown in the string graph at right. There are many kinds of strings, each corresponding to a different stopping pattern; the irregular pattern makes it difficult to memorize the timetable between any two stations. The red strings represent Baby Bullet express traffic, and the blue strings represent slower trains. When the lines cross (as circled on the diagram), one train overtakes the other. Today this can only happen in Sunnyvale or Brisbane, where Caltrain already has four tracks. Going back to our list of ideal timetable features, we can construct a string graph that includes them all. In the real world of operations planning, this is done using sophisticated simulation software, and needs to take into account detailed train performance, speed limits, curves, signal block lengths, off-nominal conditions, and knitting together with the HSR timetable (itself a complicated mess; see pages 16-24). To first order, it can be done with a spreadsheet. Download a Caltrain string graph (385 kB Excel spreadsheet) to play with it. It's quite easy to change these assumptions using the spreadsheet to see what happens. At a glance, the timetable certainly looks more symmetrical and orderly, but how does one meaningfully compare old and new? The best way to convey an improvement plan in a way that the average person understands is to publish a service improvement table, an example of which is shown at right. (This example table does not show every station pair; for brevity, it shows a sampling of 10 stations.) This table is built by simply comparing the old and new string graphs. For each station pair along the peninsula, the improvement table shows how many more trains per hour connect the station pair, and how much quicker they are than today. This table is constructed by comparing the string graph of today's timetable with the string graph we constructed above. The table is a quantitative, objective measure of the degree to which service is improved. All capital improvements on the peninsula corridor should be evaluated and prioritized by their effect on the service improvement table. Memo to Caltrain: nobody really cares about "growth" or "advanced technology" or "flexible equipment" or "power facilities", or even "less pollution" as trumpeted in the latest electrification update. Those are entirely the wrong selling points. What customers most care about is getting quickly and conveniently from point A to point B. Damn the pantographs, what you need to sell and deliver is a service plan. When people ask "what's in it for me", show them the service improvement table for where they live and work. When people worry about the disruption from the peninsula HSR project, they can see that some benefits actually trickle down meaningfully and measurably to each and every city along the Caltrain corridor. Put this table in front of city council members up and down the peninsula. Publish it in local newspapers. Make brochures. Drop leaflets. When Burlingame gets worked up about grade separations, explain to them that service at Broadway will go from none at all to a train every 15 minutes. When Palo Alto frets about community division, show them how California Avenue will see a quadrupling of service, and will be 9 minutes closer to Millbrae. 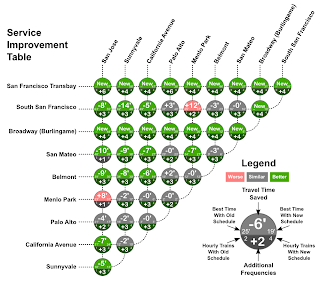 The dirty little secret is that all the service improvements described above could have been realized without HSR, requiring only a few miles of strategically placed track amplification to enable a mid-peninsula overtake, and using capital improvement funds in a targeted fashion that measurably improves service. (Instead, Caltrain is plowing $300 million into the San Bruno grade separation, which provides zero service improvement, while claiming it is fiscally doomed without HSR). The peninsula HSR project, which continues to be engineered for extremely high levels of service (despite lowered ridership estimates), will consume precious resources that currently belong to Caltrain--in particular, key portions of its corridor. Constructing HSR in a manner that precludes the above schedule, or something similar to it (i.e. clockface schedules with mid-line overtakes) from being reliably operated will forever stunt the future of the peninsula commute. That can rightly be considered totally unacceptable. The timetabling criteria outlined in this article form an objective litmus test for an important question that should linger in the minds of peninsula residents: MOU notwithstanding, is Caltrain getting screwed over by the HSR project? Armed with this knowledge, you can be the judge. The Peninsula Rail Program recently distributed follow-up materials (1.5 MB PDF) to the Context-Sensitive Solutions (CSS) workshop held in November. The included schedule reveals that the Draft Alternatives Analysis Report is delayed from January to late February / early March, compressing the environmental review schedule against the late 2012 shovel-readiness deadline. As recently as December 10th, this document had been "on schedule" for release this month. CSS stakeholders have expressed a multitude of concerns and ideas, ranging from quite reasonable to off-the-wall wacky; they must be read to be appreciated. Exactly how this laundry list of CSS concerns relates to the environmental Scoping Report is unclear. Perhaps the AA will be driven by the scoping report and the CSS workshops, which might explain the delay.